Muscletech Cell Tech Hyper-Build contains a unique blend of creatine, leucine, tart cherry and more. Warnings: Contains coconut ingredients. Processed in a facility that also processes milk, egg, soybean, wheat, shellfish, fish oil, tree nut and peanut ingredients. Do not use if pregnant or nursing. Consult a medical doctor if you have a medical condition or before starting any diet or exercise program. KEEP OUT OF REACH OF CHILDREN. Recommended Use: Mix 1 serving (1 scoop) with 12 oz. of water and drink immediately after your workout. Maintain an adequate state of hydration during use. 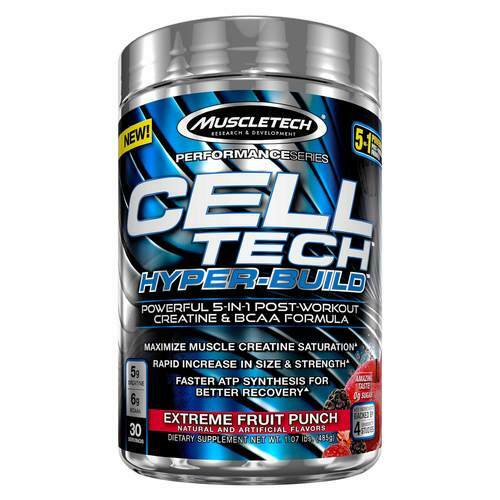 For full effects: Mix 2 servings (2 scoops) with 24 oz. of water and drink immediately after your workout.